Xander Bogaerts injures his left ankle while diving to retrieve a misplayed ball. 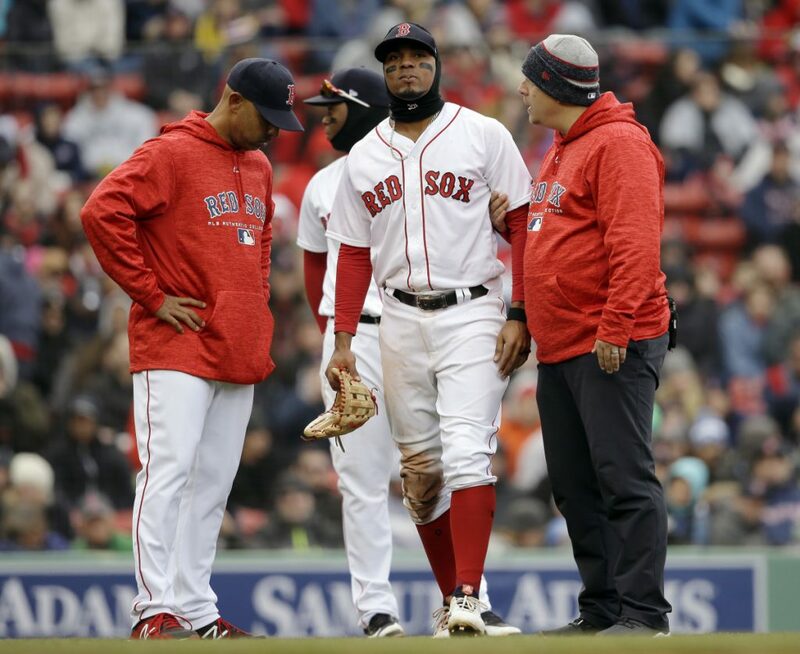 BOSTON — Shortstop Xander Bogaerts of the Boston Red Sox left Sunday’s game against Tampa Bay in the seventh inning after injuring his left ankle while sliding into the Rays’ dugout. Bogaerts was covering third base and chasing his own mishandling of a ball relayed by J.D. Martinez when he got hurt. He needed help to get off the field and walked with a noticeable limp. He was replaced by Brock Holt. Manager Alex Cora said he expected to know more about the injury Monday. Bogaerts went 1 for 3 as Boston beat Tampa Bay 8-7 for its eighth straight win. He’s hitting .368 (14 of 38) this season with two homers and nine RBI. Boston opens a three-game series Tuesday night against the New York Yankees. REDS: Third baseman Eugenio Suarez broke his right thumb when he was hit by a pitch against Pittsburgh. Suarez, who entered leading the Reds in RBI, winced after a pitch from Jameson Taillon caught him on the right hand leading off the fourth inning. Suarez was tended to by trainers before taking first base, then was replaced in the bottom of the inning by Cliff Pennington. There was no immediate word on how long Suarez will be out. RANGERS: Rougned Odor was in the lineup hours after his girlfriend gave birth to their daughter, Emma Valentina. It’s the couple’s first child. The mother, Liusca Criollo, and baby (8 pounds, 191/2 inches) are doing well at a Dallas-area hospital. “It’s a tremendous event for every parent,” Manager Jeff Banister said. Banister gave Odor the option for a day off but he wanted to play. Odor won’t take maternity leave. YANKEES: First baseman Greg Bird admitted he put up a facade regarding the status of his right ankle – where he had a bone spur surgically removed two weeks ago – throughout spring training because he thought the pain would go away, but it did not. Bird expects to have the stitches removed Monday and is targeting a return to baseball in some capacity by May, but he’s become frustrated with the handful of injuries he’s racked up in his short career. DIAMONDBACKS: Manager Torey Lovullo was ejected by plate umpire Tim Timmons during the second inning at St. Louis. Lovullo was disputing a called third strike on A.J. Pollock on Sunday and got into a shouting match with catcher Yadier Molina during the argument. BREWERS: Milwaukee placed outfielder Christian Yelich on the 10-day disabled list with a right oblique injury and brought up reliever Taylor Williams from Triple-A Colorado Springs. Yelich went on the DL retroactive to Thursday, a day after he was hurt during a 6-0 loss to St. Louis.